I’m an experimenter; a tweaker. I find it difficult to follow a recipe exactly, unless it is for baked goods, which often don’t lend themselves to much tinkering. But my tweaks in early August were a pleasure free zone. I won’t waste your time. By the third week, however, I was number 1 with a bullet (read: top of the charts and ascending!). I decided to experiment by cooking beef cheeks. I’ve tasted them a couple of times and thought they were slightly stronger tasting than a normal roast. I decided the flavours would work well in pasta sauce. I slow cooked the cheeks first, and shredded them, then added to a very simple passata sauce. My husband had pasta, I had the sauce over eggplant that I had roasted in shards in the oven. Heaven on a shard! Two thumbs up from my husband. 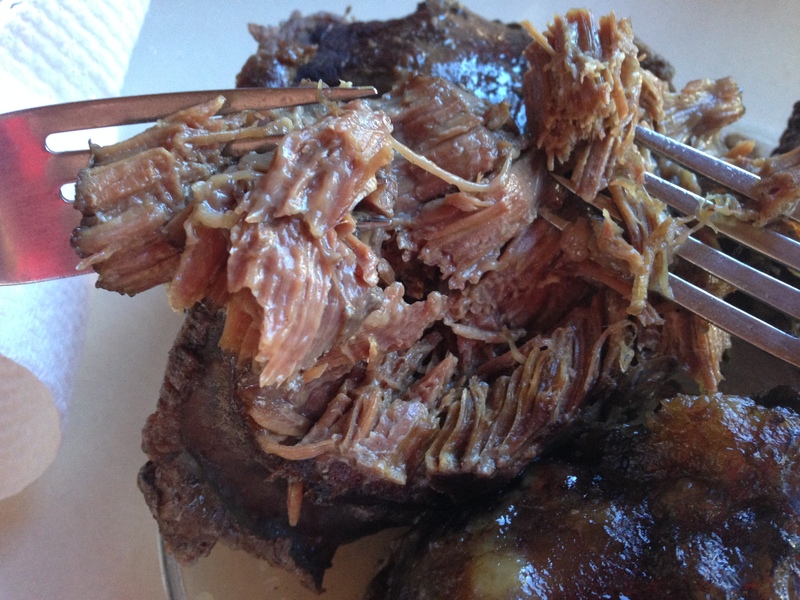 Four grass fed beef cheeks ($13.52) made enough sauce to feed 6. ‘Coconut Bacon‘ should just about offend everyone equally, I’m guessing. I’m not a vegetarian (see beef cheek paragraph above) but I used to be, for two years, and I still get curious to try things intended for vegetarians. Good food is good food. My curiosity was whether the crispy texture and savoury flavour would be nice in salads this summer. It is. 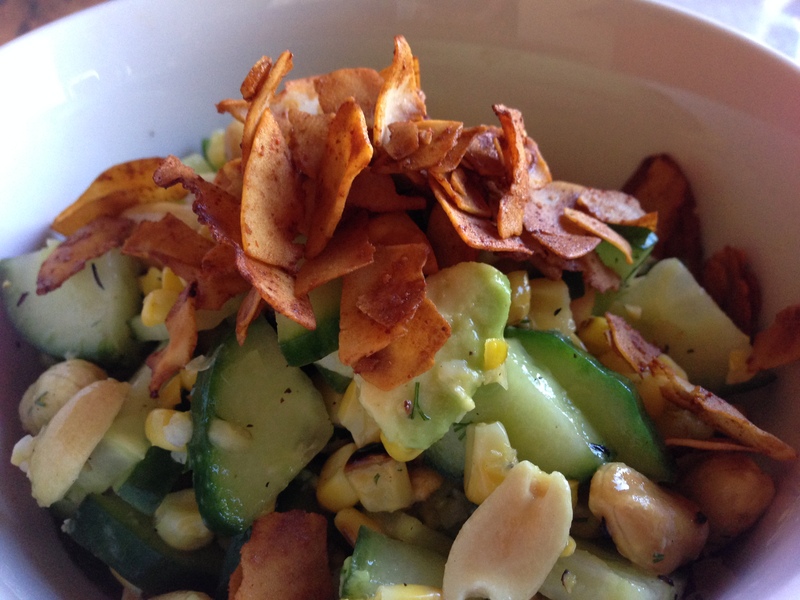 Then I tried Cucumber, Corn and Coconut salad from a favourite blog I’ve been following for a while http://www.remedialeating.com/2014/08/in-the-weeds.html Except I tweaked. My version was to use a bit of dill and some chives instead of the herbs called for in the recipe, and because I couldn’t find dry roasted peanuts anywhere in Alice, I used straight toasted peanuts, and the Maple Coconut Bacon to add the savoury element. It did work perfectly. Two thumbs up from hubby again. That’s twice in space of a week, if anyone is keeping track! We have been picking lemons by the box and basketful! It’s such a shame to not be able to use more of them, but we give them away, so nothing is wasted. I have frozen some zest and juice in ice cube trays (zest and juice of 1 lemon per cube) for use later in the year. I wish you all were here so I could give some to you! Also I have been soaking legumes and nuts before eating them, in order for the phytase to develop which lowers the phytates, which effects nutrient absorbtion. Because I drink almond milk much of the time, instead of dairy, I consume quite a few almonds. I soak them before whizzing them, the resulting milk tastes noticeably better, and hopefully, I’m getting more nutrients from them. I can now eat chick peas again, simply by soaking them for 24 hours before eating! Who knew? According to a Paleo site, ancient people used to soak most grains and legumes before eating them, but we got out of that practice somewhere along the way. Finally, Don cooked most of dinner on the grill the other night and it was amazing! He cooked the salmon filets simply, with olive oil and salt, and the eggplant strips I had simply drizzled with olive oil as well. You can also roast the eggplant in the oven, but it’s the dressing for the eggplant that made it special. As per usual, I did have to make a change in the recipe, omitting the garlic, but it was still a new favourite. Please check out the other IMK posts at figjamandlimecordial.com Thank you to Celia for hosting this monthly tour through kitchens around the world! Pop on over there and see what other interesting things are happening. What a delicious month August has been in your kitchen Ardys. 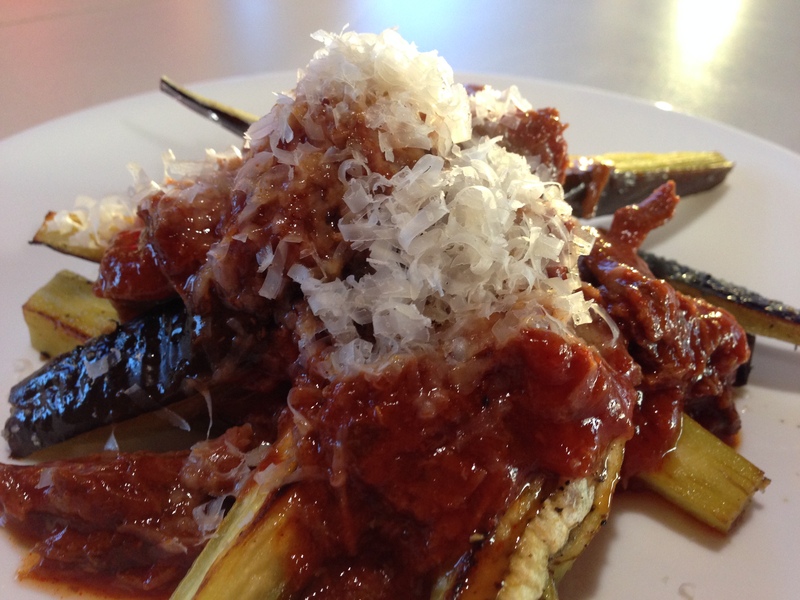 I love braised beef cheeks.What an inspirational idea to serve the shredded meat over eggplant! It was a slow start… Honestly, that sauce was better on the eggplant than pasta could possibly be. I didn’t feel the least bit deprived! I’m loving your new profile pic so we can see your lovely face as well as those red specs! G’day! 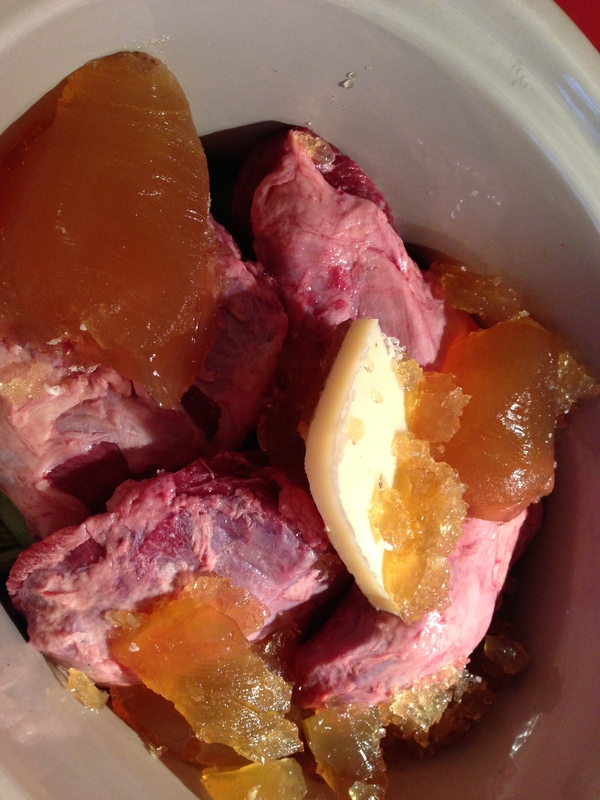 I love braised beefs cheeks and yours look terrific too! They are on my list to do! Love grilled salmon and thanks for this month’s kitchen view too! I still haven’t made beef cheeks this winter… but the weather is in my favour. We enjoy it as in the form of ragu as well. The eggplant shards sound wonderful… but then everything on your IMK post does 🙂 The food you embrace resonates with me, as I love veges but am unlikely to be anything that you can label and will remain an [as much as possibly ethical] omnivore. Don-style barbeque is one of my favourites, and at Taylors Arm the G.O. and I do similarly with him barbequing and me making a side dish. Thank you EllaDee! Sorry I missed your comment. I’ve had a crazy week! I love the blog world approach to food too! I understand what you are saying about labels with regard to the choices we make. My 12 yr old daughter and her friend decided to be ‘vegetarian’ but were concerned that they wanted to eat chicken sometimes. I told her not to be worried about labels, just eat what she liked. She has just never liked eating meat all that much, though she eats more of it now than she used to. We are both mindful of ethical and healthful eating these days, as much as is possible. Yes, lovely to have weather conducive to growing veggies again. I can only grow herbs, but I use them in nearly ever meal, so even that is a help. Thank you Tania. Two requests: send the lemons and Don. or maybe Don can bring the lemons when he comes to BBQ for us. 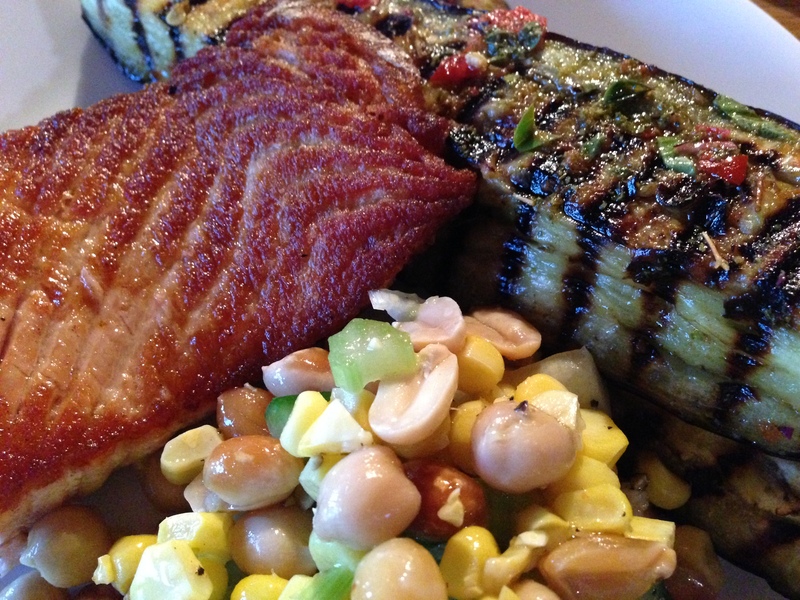 I loved the BBQ salmon, eggplant and corn salad. It is true about the soaking of seeds- I have just started doing this myself and it does make a difference. 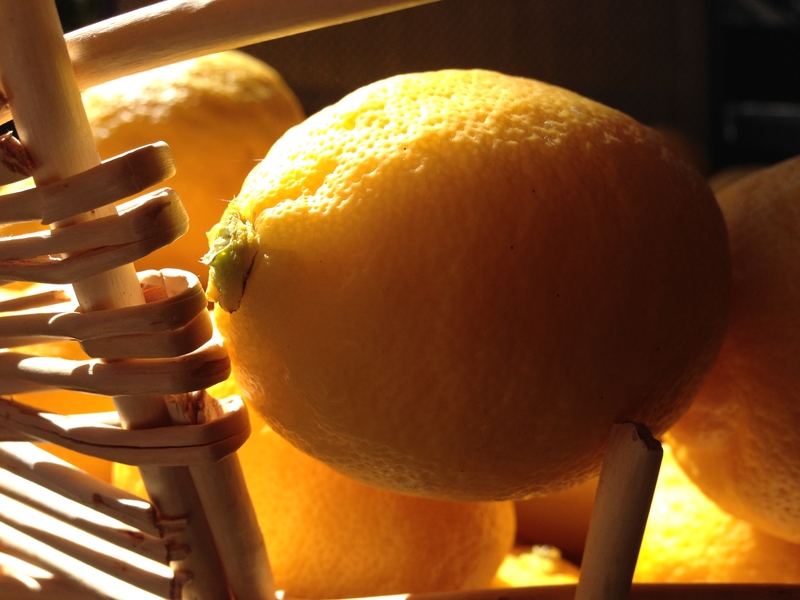 Will send contraband…and lemons as well! Wishing I lived closer for some lemons, they look lovely. Coconut bacon sounds quite interesting. Seems you have been busy in your kitchen. Considering the other projects I’ve been working on, it is nothing short of miraculous that I’ve done so much cooking the passed month. Thanks for reading! It is hard when you have a family and don’t want to cook separate meals. In January I decided to see what my body felt like without eating any grains. I replaced pasta and grains with vegetables and higher nutrient value foods and a funny thing happened. When I went back a couple of times, to eat GF pasta or something similar, I really didn’t enjoy it. I realised it didn’t have as much flavour as I had gotten used to. So the beef cheeks ragu over the eggplant was just heavenly for me, I wasn’t the least bit envious of my husband’s pasta, and roasting the eggplant while I was cooking the pasta was hardly any extra effort. Thanks for reading Suz! It’s a pity the lemons all come ripe within a few weeks. Our tree has so many blossoms set on it, we had to strip the fruit off so the new crop would set and not stress the tree. Perhaps in cooler climates this is not such a problem. Thank you for reading, Vicki! Oh those beef cheeks look divine. 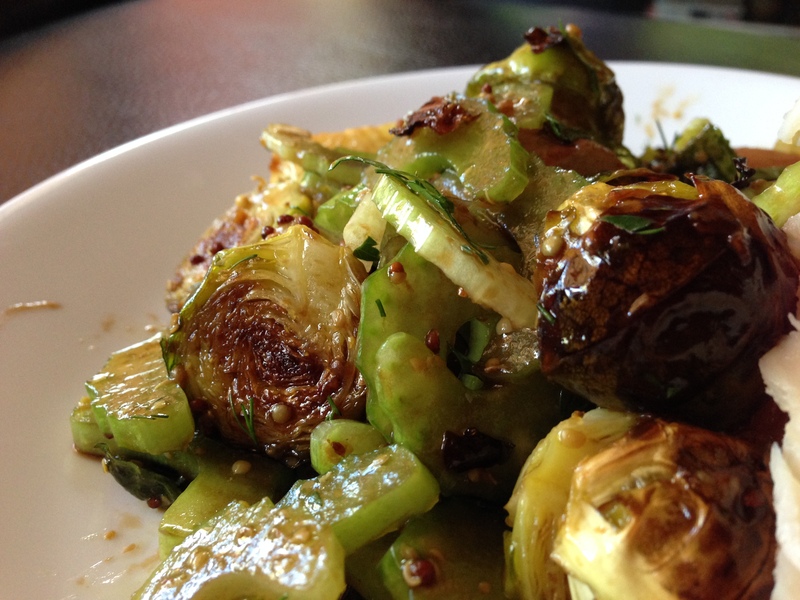 I do love me some brussels sprouts too, so I will have to check out the recipe. Thanks for the tour! I hope you like the brussels sprouts and potato salad. I have eaten brussels sprouts at least twice a week all winter. Love the little devils! Thanks for reading! Thanks so much Charlie. The beef cheeks were excellent with the eggplant. Oh my! That beef cheek ragu looks amazing. I love your grilled veggies and salmon, too, but a flavorful ragu can captivate me for days. Lovely photos, and what a fun peek into your kitchen! Thank you so much for dropping by Ngan! Falafal is a good idea, Celia. I haven’t made them in a long time but I love them. Thank you for reading Celia, and for hosting this very fun gathering of kitchenalia! Hello Food Fairy! I have tried preserving the lemons with salt, but I found I didn’t use enough of them to be worthwhile. I hope you get to enjoy the beef cheek ragu. Yes, lemons are very expensive here at times too, which is why I’m freezing as much juice as my freezer will hold. Thank you for stopping by! I just stumbled onto your blog this morning and can’t wait to spend a bit more time exploring. Meanwhile, I have a question about lemons. I watch too many cooking shows and one always sees chefs grab a lemon and start zesting away. Am I to assume that no sprays are ever used on lemon trees? (we don’t grow lemons in Kansas), or that all those lemons have been pre-washed? Am I the only one who wonders about this? I really am shocked at how well citrus grows here with our hot, dry summers. But I suppose it is close to the Mediterranean climate so that is why. We don’t spray our citrus trees but I still wash the fruit, and all fruit, before I eat it. I hope other readers will take note of your name! This is the first time I have met someone else with the same name as myself, and it is such an unusual name, that is saying something! Thank you for reading. Thank you for stopping by Moya. That is very interesting that beef cheeks are served in Bahrain! Who knew? We eat quite few BS too, but especially me. I have them at least twice a week while they are in season. Thanks for reading, Sherry.